RockCrusher, Other Guitar Accessory from Rivera. The new Rockcrusher attenuator handles 120 watts and features a stepping switch controlling a reactive load. Unlike the simple resistive loads used in many attenuators, this means the Rockcrusher responds more like a loudspeaker and doesn't mess with your amp's tone, according to its manufacturer. 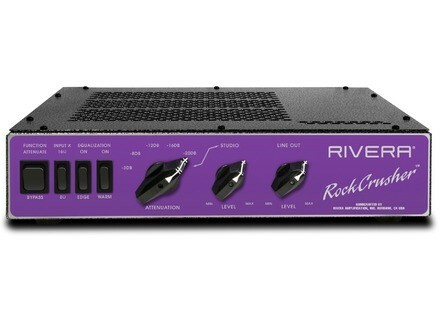 The Rockcrusher also features switchable input impedance, EQ controls, and separate balanced and unbalanced line outs. [NAMM] PRS Dweezil Zappa Private Stock Limited to a run of 50 guitars, the new Dweezil Zappa Private Stock semi-hollow model features a Custom 24 mandolin shape and is modelled after the guitar Dweezil designed with the Private Stock team. [NAMM] HardWire HT-6 Polyphonic Tuner HardWire introduces the new HT-6 Polyphonic Tuner, a tuner for guitarists and bassists that can be used to tune all 6 strings of an instrument simultaneously. [NAMM] PRS Studio Electric Guitar PRS's new 22 fret, 25" scale length Studio model electric guitar is a modern rendition of a traditional single-single-hum guitar set up with a maple top.